DV/AVCHD Recording on an SD Memory Card with Shoulder-mount Stability. H AG-AC8, αποτελεί μία Full-HD 1080P AVCCAM κάμερα ώμου, που σχεδιάστηκε δίνοντας έμφαση στην εργονομία και την λειτουργικότητα. Ταυτόχρονη εγγραφή σε 2 κάρτες SD ταυτόχρονα, 21x οπτικό ζουμ και ευφυές σύστημα auto mode (iA), είναι μόνο μερικά από τα χαρακτηριστικά του νέου μοντέλου. High-Powered Lens, High-Sensitivity Sensor and High-Quality Full-HD 10 Bit 4:2:2 Recording - Shoulder-Type Performance in a Handheld Camera for Broadcasting and Production Work. The HDC-Z10000 is Panasonic’s first integrated twin-lens 2D/3D camcorder that is fully compatible with the AVCHD 3D/Progressive standard. It achieves the industry’s nearest close-up of approximately 17.7 inches (45cm) for a twin-lens 3D camcorder, while maintaining an equivalent 32mm wide angle of view. It records close-up images that would be conventionally difficult to capture in crisp detail. With a new, advanced 1/3" 2.2-megapixel 3-chip imager featuring Ultra Luminance Technology (U.L.T. ), the HPX71 delivers exceptional video performance for master-quality HD production. F1.4 brightness allowing a beautiful soft focus for photos and videos to be even more impressive. A superb image quality with minimum distortion, chromatic aberrations that pass a stringent Leica standard. 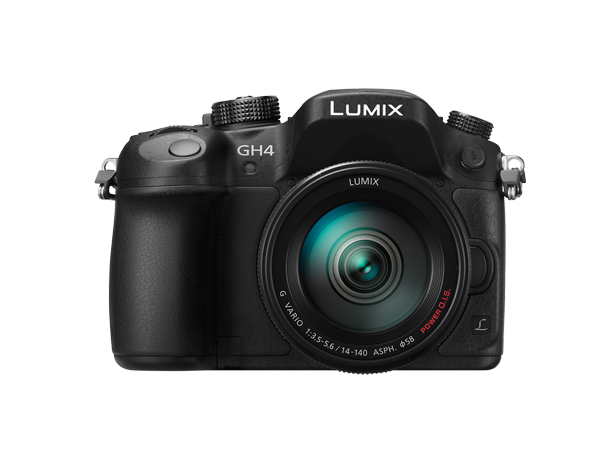 The worlds lightest* interchangeable single focal length lens LUMIX G 14 mm / F2.5 ASPH. features a 14mm (35 mm camera equivalent: 28 mm) wide angle and F2.5 brightness with sharp, high contrast image rendering. Panasonic’s long time collaboration with Leica inspired a uniquely LUMIX in-house design for a premium lens series exclusively for LUMIX G Series Micro Four Thirds mirrorless cameras. Panasonic's long time collaboration with Leica inspired a uniquely LUMIX in-house design for a premium lens series exclusively for LUMIX G Series Micro Four Thirds mirrorless cameras. The LUMIX G vario 14-140mm/F3.5-5.6 ASPH. /POWER O.I.S. offers high mobility thanks to the ultra-compact size and lightweight. Consist of 3 aspherical lenses and 2 ED lenses for superb optical performance. Η 1η DSLM φωτογραφική μηχανή με δυνατότητα εγγραφής video 4Κ ανάλυσης!